Having trouble thinking of something to give the ladies on you Christmas list? Give them some cozy slippers that are one of a kind? Take out the plain old leather tie and add in their favorite color to make slippers that are extra special. You can personalize these with their school colors, favorite sports team colors, or just something that fits their style. I love walking around the house in my favorite slippers. I wear them constantly during the cold winter months because they are comfy and cozy. This was something that I enjoyed so much over the last year that I decided that it would make a great gift for the ladies on my Christmas list. Last Christmas I picked up a couple pairs of these slippers on sale after Thanksgiving for myself. I think they where only about $7.00 at Kmart but you can find them just about anywhere. I loved everything about them except for the annoying leather ties. The leather didn’t stay tied. My fix was to replace it with some pretty ribbon and glue the bows to stay. Not only does it make the slippers extra cute, but they stay tied with pretty little bows. I decided that the leather tie had to go. I found some ribbon that was brightly colored and fun to replace the leather tie with. I replaced the leather strip with some hot pink ribbon to make the slippers all my own. 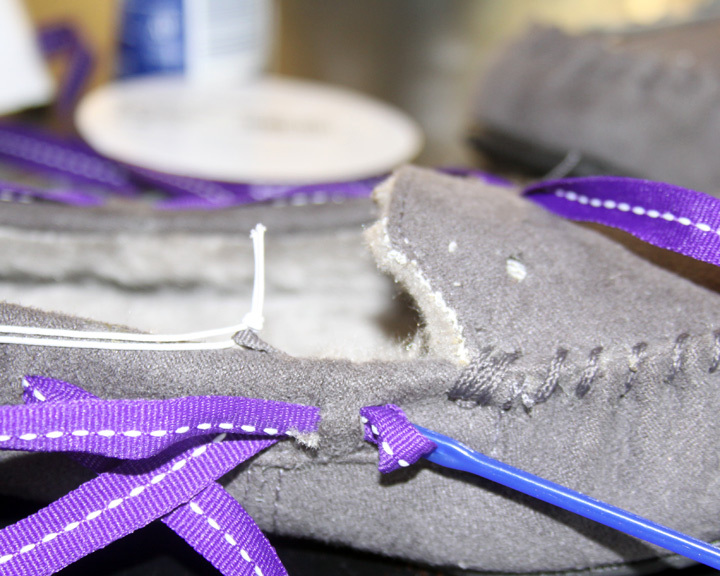 Just thread the colorful ribbon through the slippers the same way the leather one was, using your plastic needle. Make sure you take a look at the leather before you remove it to see the best way to put the new tie in. You just feed the ribbon through making sure it goes in without being twisted or tangled. This literally takes a couple minutes to do. Cut the ends of the ribbon and tie a pretty bow on top of the slippers. Add a couple of dabs of fabric glue to the knotted bow to keep the bow from coming untied. You can add a small amount to the raw ends of the cut ribbon to keep them from unraveling or use a lighter to singe the ends a tiny bit. That is it. Now you have some fun slippers to sport this season or to give to your favorite people as gifts. These are the perfect gift for any aged woman. Give the gift of coziness, but with some personalized style. I think these would be a great gift for preteens and teens to make for their friends using school colors or fun and funky ribbon. 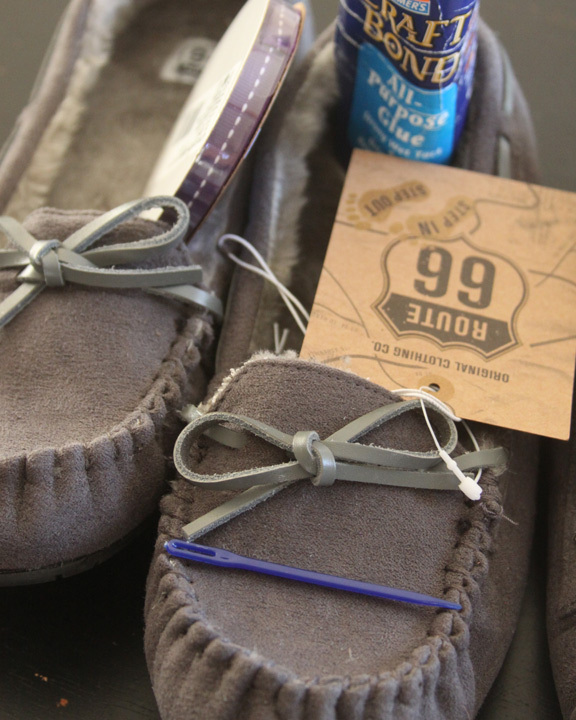 Add you family or friends favorite sport’s teams colors to create some game day slippers. They are so unique and inexpensive to make. Be creative and have fun with it! I will be giving these to my favorite girls on my Christmas list with a homemade infinity scarf and tucked inside of a hand made ruffled purse. These are my three favorite do-it-yourself projects from this year, and I think my friends will love them. Soft, cute, and cozy warmth all wrapped up in ruffles – what is not to love?